Sometimes a song can absorb a certain connotation based on the situation in which one is first exposed to it. That can have a positive or negative impact, or none at all, of course; a relatively unremarkable song can become a thrilling track if discovered at a moment of great joy, and vice versa. For me, for instance, the exciting and intense situation in which I first heard an advance copy of Britney Spears' album In the Zone, then still months from release, helped make "Toxic" transcend its already inherent greatness to something bordering on orgasmic in my mind. Not so, though, years later, when I first heard "Release Me," by Swedish singer Agnes, during an undesired jaunt in the company of those I'd have preferred to avoid. 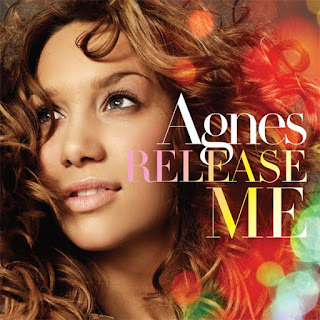 Agnes won the second season of the Swedish rendition of the Pop Idol series in 2005, and by 2008 had pumped out three albums, the third of which, Dance Love Pop, was given international release over the next three years (the U.S. release was just this March). The very trance/deep clubhouse sound of the song at the outset turned me off at first, and I never really bothered to give it much play after that for a while. Then the singer came up in my blog reporting when Spears, who shares a manager with Agnes, made mild waves when she appeared at the White Party in Palm Springs to watch the singer perform at the closing concert (from a giant secluded cage, but still), and somewhere in there I added the song to my library, but didn't touch it again until recently when it found its way to a playlist I ran while doing some chores, at which point I actually listened to the track in its entirety. It was then I discovered that after thirty seconds of hard trance production, the song mutates into an upbeat, danceable blend of, say, Donna Summers, Samantha Mumba and September - and instantly became one of my new favorites of the moment. So I submit "Release Me" to you for your own consideration - or reconsideration - in hopes that my little spoilers may help clear the road to enjoyment of this good, loud, fun dance party.